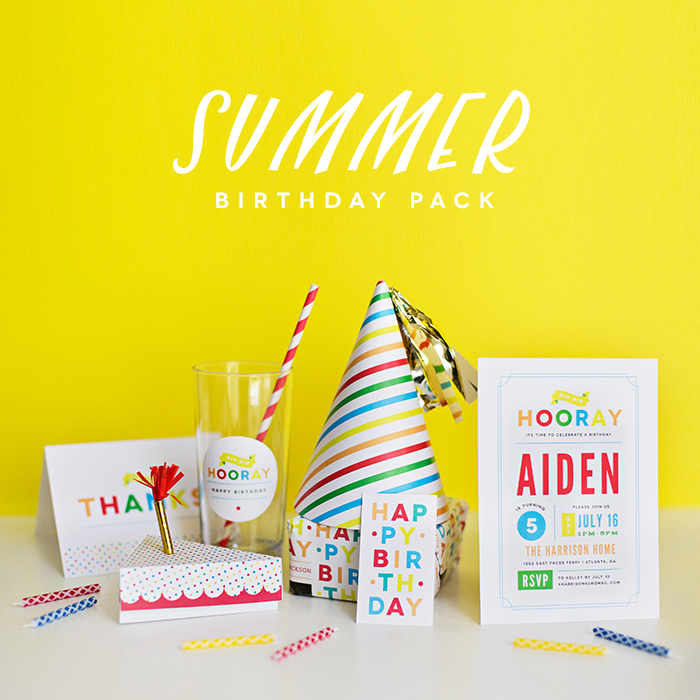 Summer Birthday Pack: Printables, DIYs and so much more! 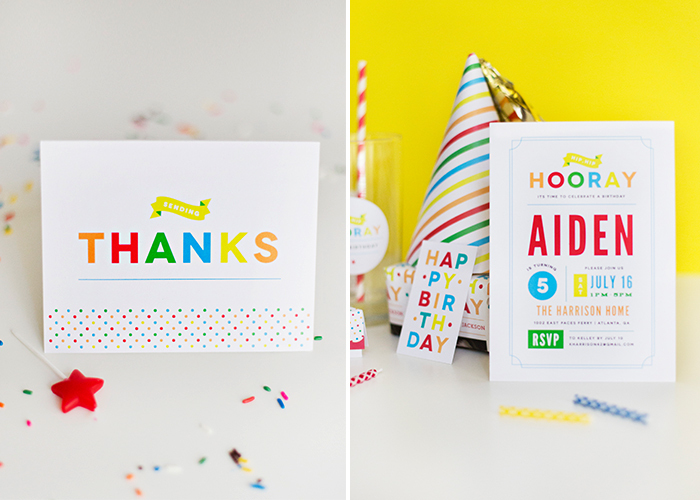 30 May Summer Birthday Pack: Printables, DIYs and so much more! Summer is officially upon us folks! Time to soak up some sun, enjoy the longer days and hunker down for the wave of birthday invites to soon flood your inbox. But fear not! If you have been tasked with planning an epic summer fling, it just so happens that we have an equally epic birthday kit perfect for you! 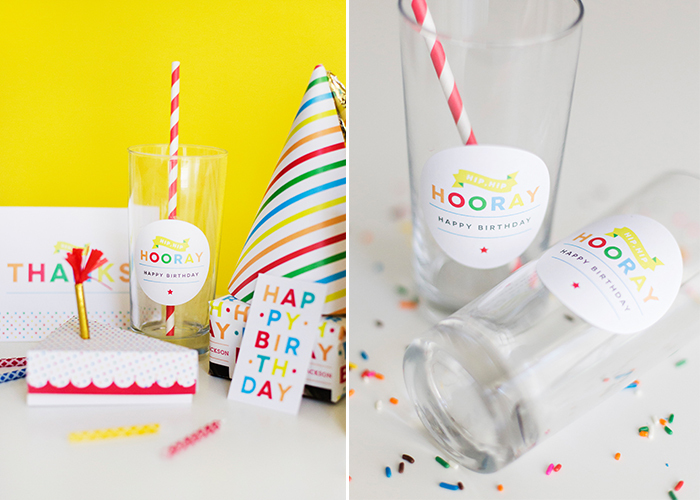 First up, let’s get crafty with some super cool birthday DIYs! 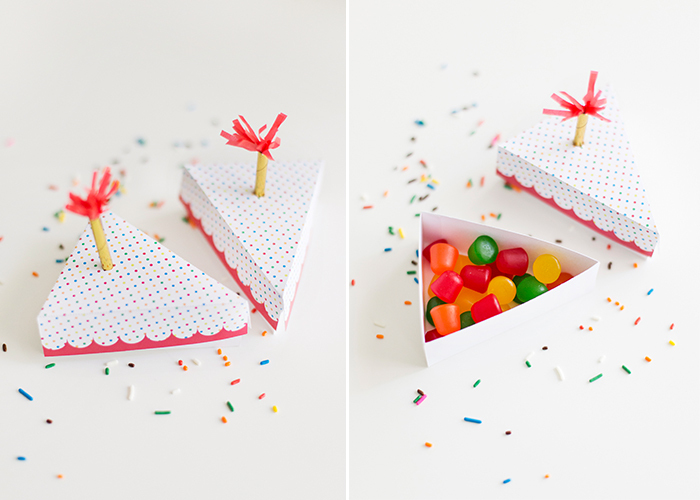 Step 1 – Trim out the top and bottom of your favor box and use a ruler to score along the dotted lines to allow for easier folding. Before folding the lid of the box, cut out the small circle on the top with the exacto knife. Step 2 – Cut a piece of red tissue paper measuring 2.5″ x 1.5″. Fold in half vertically and fringe like the picture shown above. Be careful to not cut too close to the center. Now roll along the side not fringed and cinch the bottom. Step 3 – Cut gold party straw down to a 3″ piece. Dab a bit of hot glue on the fringe and tuck the cinched end inside the top of the straw. Now slide the straw into the hole through the center of the lid. You can secure with hot glue if you like but should not be necessary. Step 4 – Fill with delicious candy! 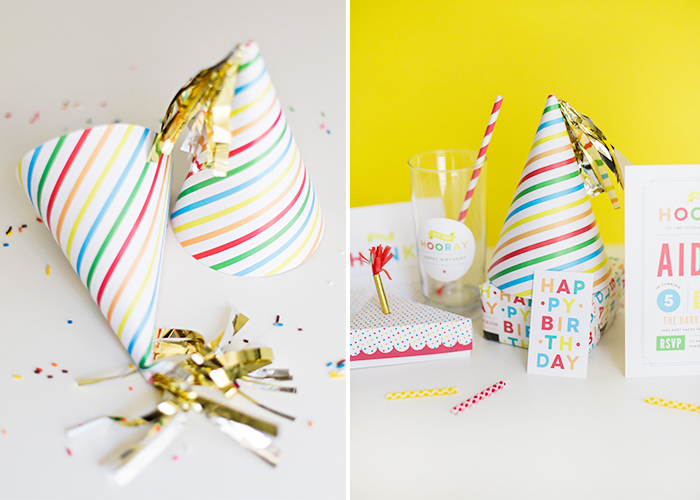 Our next DIY item is this flashy party hat! 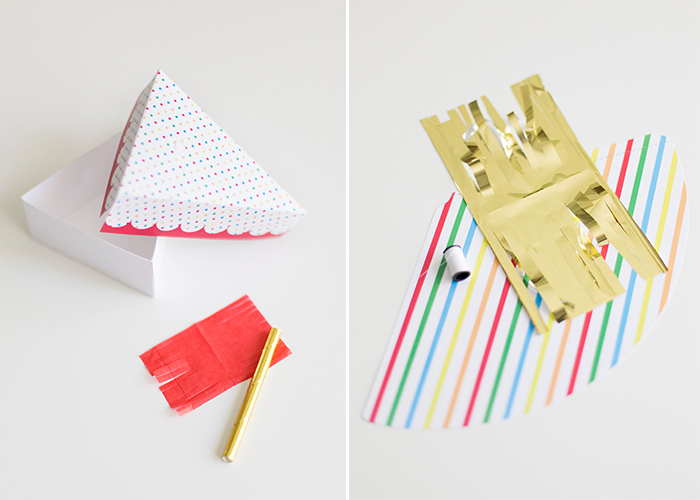 Step 1 – Trim out the party hat template and score where you see the dotted line with your exacto knife. Set aside. Step 2 – Cut out a section of foil tissue paper 8″ x 4″ and then fold in half vertically. Fringe the non folded side every half inch as pictured above. Unfold and roll tightly. Cut a piece of thread 8″ long and tie directly in the center of your fringe roll, leaving tails of thread on both side. Step 3 – With tape, secure the tails to the inside surface of the hat (not the side with the stripes) so that only the fringe is visible on the outside. Once secure, roll hat into a cone shape and double stick tape the scored flap to close. Step 4 – Use a hole punch to add holes on opposite sides and secure to head with string, elastic, or ribbon! 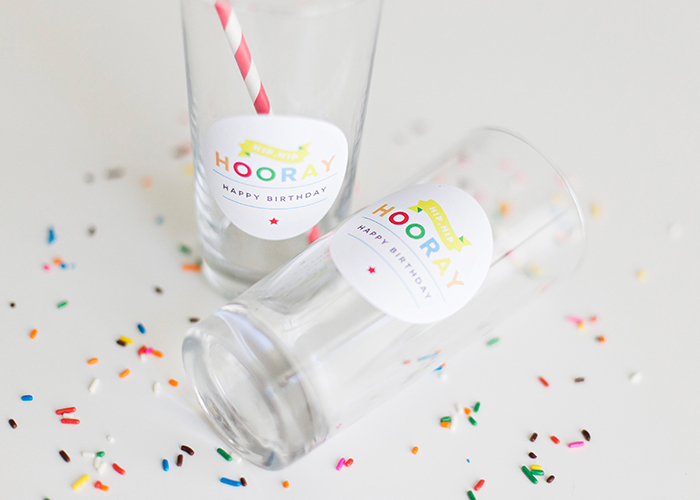 Our Party Sticker Printables are the perfect accessories for drink ware, favor boxes, balloons, you name it! They are 2.5″ in diameter and are designed to be used with a craft punch and full sheet label paper like this (be sure to purchase either Laser or Inkjet based on the printer you plan to use). Simply slide your printed sheet into the craft punch, with the clear bottom side up so you can check alignment, and then punch! The favor tags are 10 to a sheet and easily trimmed with scissors or a paper cutter. The “Sending Thanks” tags can be found here, and the “Happy Birthday” tags here! 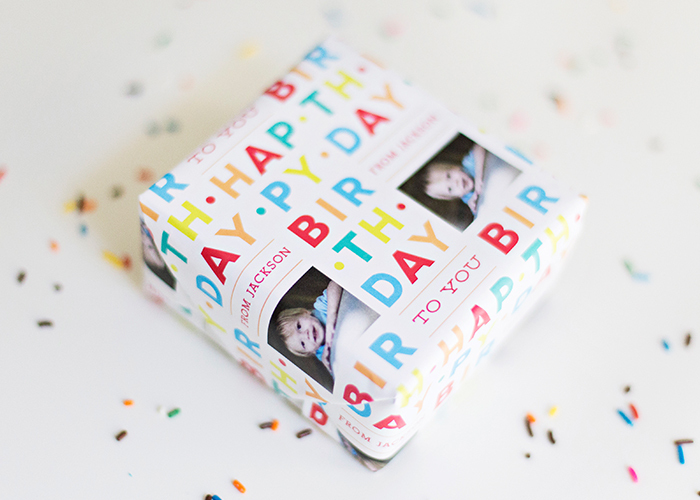 And don’t forget this adorable matching wrapping paper! The template is editable so the paper can be designed as a gift from your little one, or altered to be for them as well! The final two pieces are certainly the key ingredients! In order to set the tone early for your festive affair, you need the perfect invite! 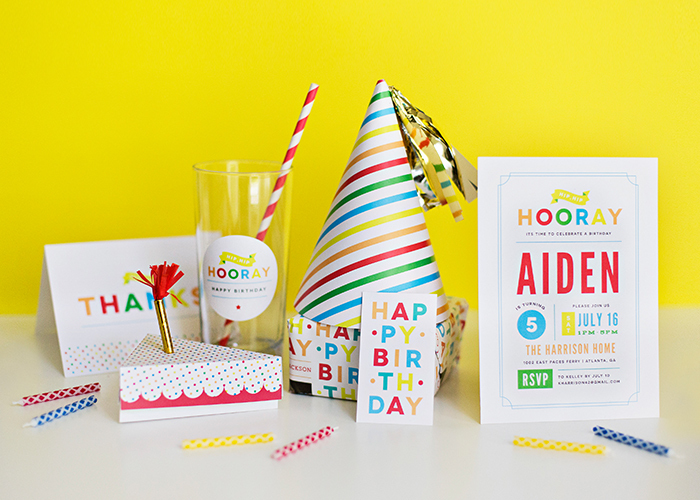 Our Summer Birthday invite is bright and bold and completely customizable! Get it in the store here along with it’s matching thank you! Wishing everyone a fabulous summer!